Welcome to FungusCME.org - FungusCME.org is the official continuing education site of the collaboration of the Mycoses Study Group Education & Research Consortium; the University of Nebraska Medical Center, Center for Continuing Education; and Terranova Medica. FungusCME.org is the official continuing education site of the collaboration of the Mycoses Study Group Education & Research Consortium; the University of Nebraska Medical Center, Center for Continuing Education; and Terranova Medica. The MSG-ERC’s mission includes setting the annual educational and research agendas for mycology and providing top-quality continuing education initiatives to MSG-member institutions and to other institutions and practitioners throughout the United States and globally. We thank our generous commercial supporters for their commitment to our live and web-based continuing education efforts. We hope you enjoy the variety of continuing activities present on this site, and we welcome your input on ongoing educational needs in the area of invasive mycoses. Click Here to Learn More, or use the links below to register or login. Invasive molds can be formidable foes for clinicians to face off with. In this highly interactive and visual case-based activity, Drs John Perfect, Tom Patterson, and Francisco Marty provide expert perspective on the prevention and management of invasive molds. Addressing topical issues such as cryptic Aspergillus spp and azole resistance, aspergillosis associated with influenza, antifungal prophylaxis and breakthrough infections, mucormycosis diagnosis and treatment, green herring syndrome, and diagnosis and management of fusariosis, this fast-paced activity will arm you with the tools you need to effectively face off against these challenging fungal infections. This interactive, multimedia activity is designed to evaluate different approaches to managing clinical scenarios at the frontiers of invasive fungal infections. Explore the levels of evidence behind different strategies, contrasting expert decision making with your own approach and those of your peers. Specific content on Candida auris infection, pharmacologic aspects of antifungal prophylaxis in an HSCT patient, and management of a refractory mold infection will be provided. Dr Sibylle Mellinghoff reviews high-impact poster/oral presentations and papers related to diagnostics, including MALDI-TOF, GM testing, β-D-glucan testing, fungus-specific T cells, as well as therapeutic dose monitoring, multidrug-resistant fungi, mold lung infections, and emerging therapeutics. Dr Martin Hönigl provides an overview of the clinical implications of this research. We hope you find these timely updates helpful for you in caring for patients with invasive fungal disease. Dr Justin Hayes of the University of Alabama School of Medicine (UAB) reviews recent data on: the impact of ID consultation/diagnostics on candidemia outcomes; Candida auris and antifungal resistance; antifungal prophylaxis; and CNS histoplasmosis and screening for cryptococcal antigenemia in solid organ transplant recipients. Dr Peter G. Pappas, also of UAB, provides a clinical commentary on these studies. We hope you find this edition of the Minutes an enlightening and thought-provoking encapsulation of emerging science/data in mycology. Originally launched in 2014 and updated through 2016, The Antifungal Toolkit: The Pharmacopeia and Beyond is an Internet CME curriculum that provides current information about newer FDA-approved agents/formulations for the management of invasive fungal infections (IFIs) and evaluates their role in strategies to optimize antifungal therapy. In the 2017 updates, we have updated the discussion of newer agents/formulations, emerging agents/diagnostics, and pharmacologic principles/data. This is an interactive, enduring multimedia activity based on content presented at the 2016 MSGERC symposium at ASM Microbe. 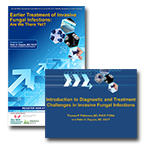 With content spanning from updates on diagnostics and pharmacologic considerations for therapies to challenges in the management of invasive aspergillosis, invasive mucormycosis, and breakthrough infections, this activity addresses key clinical issues for optimal invasive fungal disease (IFD) management. In addition, we have also included fungus-specific updates from the Microbe meeting in the companion Mycology Minutes™ activity (see link below). We hope you find these activities helpful as you hone and update your strategies for managing these difficult infections. 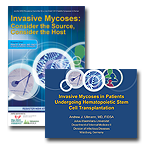 In this interactive, enduring multimedia activity based on a 2015 American Society of Hematology Satellite Symposium, experts in hematology/oncology, infectious diseases, and pharmacy discuss optimal strategies to prevent and treat invasive mycoses in hematologic malignancy patients. This initiative features both video and text-based presentations of key epidemiologic data, diagnostic and therapeutic options, pharmacologic considerations, and guidelines/expert opinion on strategies to decrease the spectre of invasive fungal infections for patients with hematologic malignancies. It features in-depth discussion of real-world issues encountered in optimizing therapy and an international, esteemed faculty. Challenges in IFD Management: Forward-Thinking Strategies is an enduring activity based on content presented at 2015 MSG-ERC symposia at ICAAC/ICC and ID Week. The activity is designed to provide top-line updates on invasive fungal disease (IFD) diagnostics and therapeutics as well as controversial/forward-looking topics in mycology reviewed in a panel-discussion format. The activity includes relevant, interactive case challenges that highlight practical aspects of IFD case, interdisciplinary management, as well as international perspectives on patient-care strategies. Clinical Decision Making in Mycology: Working Through Difficult Scenarios is the enduring activity from the Mycoses Study Group Education & Research Consortium (MSG-ERC) CME symposium presented at ICAAC 2014. This activity is designed to address the relationship between decision making and outcomes in invasive mycoses. After an introduction and review of emerging therapeutic and diagnostic options, the activity will turn to an in-depth exploration of 2 cases—a hematologic malignancy and an intensive care unit case—that illustrate key decision points affecting potential outcomes across the disease spectrum. By using a branching, decision-tree approach that follows the cases out to potential logical conclusions, the activity challenges learners to evaluate their own practice patterns in an effort to overcome barriers and achieve better outcomes for invasive fungal infections (IFIs). The New Antifungal Toolkit: The Pharmacopeia and Beyond is an Internet CME curriculum that will provide current information about new FDA-approved agents/formulations for the management of invasive fungal infections (IFIs) and evaluate the role of these newer options in strategies to optimize antifungal therapy. As such, the activity will move beyond the typical drug pharmacopeia to address dosing in special populations (eg, pediatrics, patients with renal insufficiency, specific host types), health economic data, as well as comparative effectiveness, where appropriate. The activity will also include a broader pharmacopeia of all FDA-approved agents for invasive mycoses as a useful point of comparison as well as a practice reference. Planned updates at 4 and 8 months will cover any additional FDA approvals and keep the learner up to date as research data for newer agents mature and clinical experience grows. In this interactive, enduring, multimedia activity is based on the third and final component of the ICAAC 2013 satellite symposium, Invasive Mycoses: Consider the Source, Consider the Host. In Invasive Fungal Infections After Solid Organ Transplantation, Barbara D. Alexander, MD, MHS, FIDSA, discusses a case highlighting the management of an invasive mold infection in a patient post lung transplantation. In this activity, Dr Alexander reviews fungal epidemiology based on type of organ transplanted and time from transplantation, explores the performance characteristics of fungal diagnostics specifically in the SOT setting, reviews the guidelines for management of fungal infections in SOT, and discusses genomics and other host defense issues impacting response to therapy. The activity will also include bonus material about current and emerging antifungal therapy and diagnostic options (developed by Peter G. Pappas, MD, FACP). In this interactive, enduring, multimedia activity is based on the second component of a liveICAAC 2013 satellite symposium, Theoklis Zaoutis, MD, MSCE, discusses cases illustrating the state-of-the-art management of invasive fungal infections (IFIs) in children. Highlighting important issues for the prevention and management of invasive candidiasis and invasive mold infections in oncology and ICU settings, Dr Zaoutis also reviews the levels of evidence behind different diagnostic tests in children, drug dosing strategies, as well as the role of therapeutic dose monitoring. The activity will also include bonus material about current and emerging antifungal therapy and diagnostic options (developed by Peter G. Pappas, MD, FACP). In this interactive, enduring multimedia activity based on a live ICAAC 2013 Satellite Symposium, Andrew Ullmann, MD, FIDSA, discusses cases illustrating optimal antifungal strategies for at-risk hematopoietic stem cell transplantation (HSCT) patients and for those with documented infections. Join him as he reviews prophylactic strategies as well as first-line and second-line therapy options for aspergillosis and fusariosis. Dr Ullmann also reviews risk -assessment criteria, diagnostic challenges, and host factors affecting outcomes. The activity will also include bonus material about current and emerging antifungal therapy and diagnostic options (developed by Peter Pappas, MD). Early Diagnosis and Management of Invasive Fungal Infections: Are We There Yet? This enduring activity is based on highlights of a live ICAAC 2012 Satellite Symposium, September 8, 2012, in San Francisco. Join the MSG ERC for this online, case-based educational activity that addresses the question of whether or not we have entered an era in which appropriate diagnostics and therapeutics can be employed early in the management of invasive mycoses to improve antifungal outcomes. In this 2-hour, menu-driven activity, you can review overviews on therapeutics and diagnostics as well as the case-based discussions in the areas of aspergillosis, candidiasis, crypotococcosis, and endemic infections. Lending their expertise to the faculty panel are noted authorities in the field: Nelesh Govender, Peter G. Pappas, Thomas F. Patterson, George Thompson, Jose A. Vazquez, and Paul Verweij.